Herring Under a Fur Coat is a dish that most people, at least most people with no connections to Russia, have never heard of. It’s a funny name, and it’s kind of funny looking too. This super-traditional Russian salad is also a bit strange to the American palate, to be perfectly honest. Reminiscent of the 50s, when layered mayonnaise-based salads reigned supreme, the most traditional version looks a bit gloppy and intimidating. 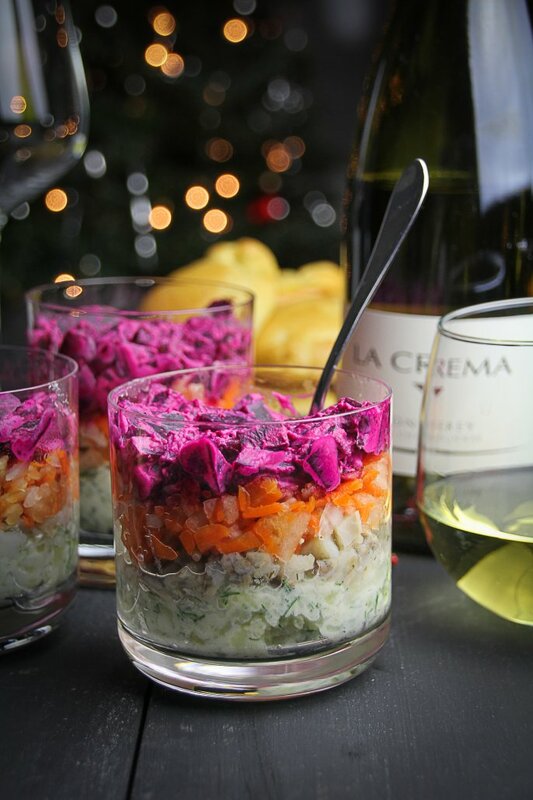 However, it is one of the most quintessential Russian New Year’s dishes, so I wanted to see if I could create a somewhat modernized, American-friendly version for this Russian New Year’s Eve dinner menu. In my modernized version of the “Herring Under a Fur Coat” classic recipe, I set out to make every layer taste good on its own. The bottom layer consists of potatoes, dill, chopped pickles, and sour cream; all the flavors of a good dilly potato salad. The next layer is the fish, and here you have two options. The most traditional thing to use, and the namesake of this dish, is pickled herring. It is a little bit of an acquired taste, so if you’re skeptical, you can also use flaked, hot-smoked salmon. I made both versions, and actually liked both versions, but preferred the salmon. Next come the vegetable layers. 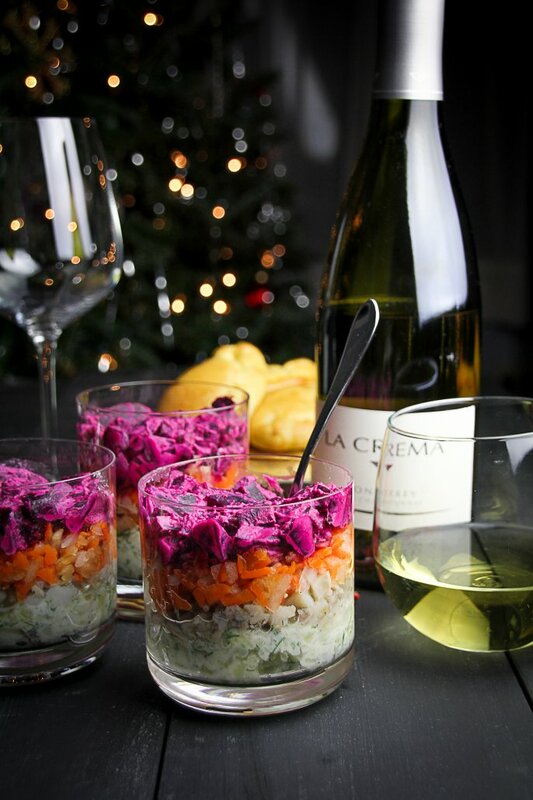 The traditional layers are shredded boiled carrots, shredded raw onion, and shredded boiled beets mixed with mayonnaise. Because of my goal to make every layer stand on it’s own, flavor-wise, I decided to mix the shredded carrots and shredded onions together, add shredded raw apple for extra sweetness, and a squeeze of lemon to bring the flavors together. The boiled beets I kept largely the same, I just mixed them with crème fraiche and a bit of salt and black pepper. I also kept them diced rather than shredded for variety in texture. Most recipes call for sieved hard-boiled eggs to top off the dish, but I opted to skip the eggs, mainly for the sake of simplicity. I also skipped the mayonnaise, which most recipes call for in spades, either as a top layer (the white “fur coat”) or mixed in with the beets. I’m just not a huge fan of mayo, so I opted instead to mix the beets with a conservative amount of crème fraîche, and to use a little sour cream in the potato layer. To me, this makes the dish more appetizing, but it also removes it a step further from the most traditional version. 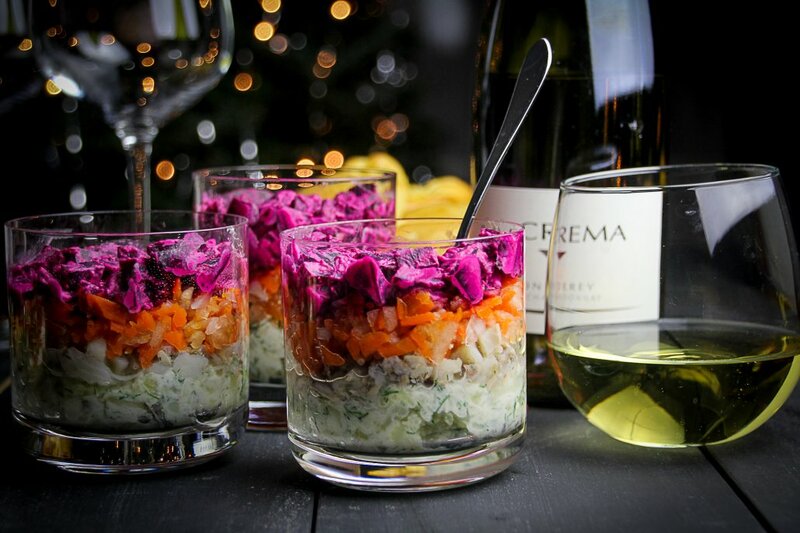 Last, rather than serve this in a large, sliceable format, I created individual layered salads in juice glasses. Again, not traditional, but I think it makes this easier to serve at a party. Guests can just grab a glass and a spoon and mingle. After all these changes, is it still fair to call this dish Herring Under a Fur Coat? I think so! The two dishes have the same spirit. I encourage you to give this one a try. Even if it takes a little getting used to, it will definitely expand your palate (and it’s a good conversation starter, too). 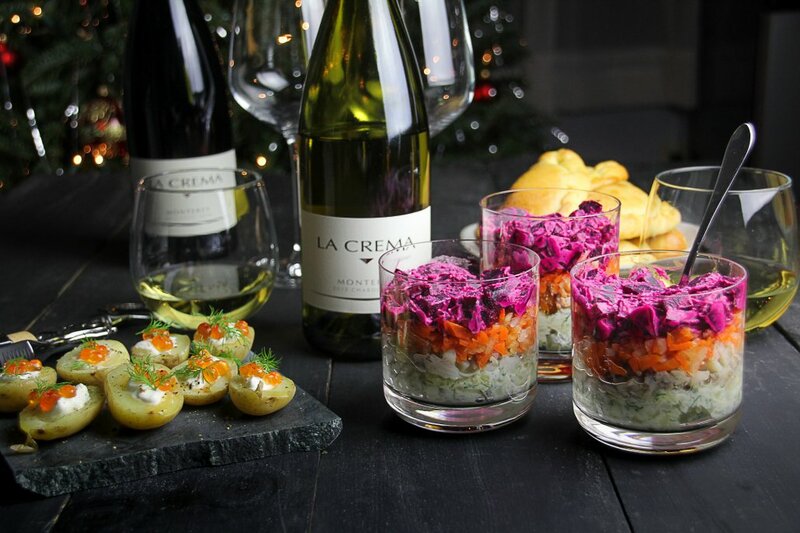 Serve this one with La Crema Monterey Chardonnay. Inspired by recipes for traditional Herring Under a Fur Coat on Food & Wine, The Spruce, and Natasha’s Kitchen. To prepare the beets: Cut off the root end of each beet and any remaining greens. Place the beets in a large saucepan and cover with cold water. Bring to a boil over high heat. Boil the beets until they are tender when poked with a fork, about 60-75 minutes. Drain the beets and let cool. When they are cool enough to handle, but still warm, peel the skins off the beets – they should slip easily off when you rub the beets between your hands. Chop the beets into quarter-inch dice and place in a bowl. Mix with the creme fraiche, then season to taste with salt and pepper. Set aside. To prepare the potatoes: Place the peeled potatoes in a large saucepan and cover with cold water. Season the water generously with salt. Bring the potatoes to a boil over high heat. Boil the potatoes until they are tender when poked with a fork, about 10-15 minutes. Drain and let cool. Chop the potatoes into quarter-inch dice and place in a bowl. Add the minced dill, chopped pickle, pickle juice and sour cream to the potatoes. Stir vigorously, slightly mashing the potatoes as you do so, until ingredients are fully incorporated. Set aside. To prepare the carrots: Place the peeled carrots in a large saucepan and cover with cold water. Season the water generously with salt. Bring the carrots to a boil over high heat. Boil until they are tender when poked with a fork, about 5 minutes. Drain and let cool. Shred the carrots on the large holes of a box grater. Place the shredded carrots in a bowl. Shred the apple on the box grater and add to the bowl with the carrots. Add the chopped onion to the bowl and stir to combine. To assemble: Divide the potato mixture between four juice glasses, pressing down with a fork to form an even layer. Top with a layer of the fish. Next, divide the carrot mixture between the four glasses, again pressing down to form an even layer. Finally, top with the beet mixture. Cover the glasses with plastic wrap and chill for at least two hours before serving. Serve cold.